River and Amwell Roads intersected in Neshanic. 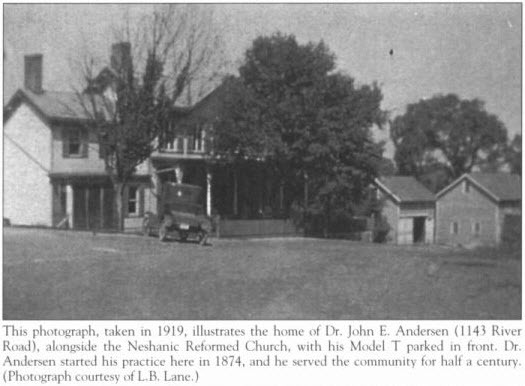 The junction had an old stone church built in 1752 and about fifteen large Victorian homes surrounding. A quarter mile to the east was a large property and one of three seemingly abandoned homes in the small community. This one included four or five small barns and workshops and at one time must have been a very busy farm. To a ten-year old in 1969, the whole property, in fact, most of the abandoned properties, where exceeding simple and quiet places to escape and explore. There were never any worries of adults coming and reprimanding - no one seemed to care whether or not we were there. The houses, built before electricity or indoor plumbing, were miniature monuments to a forgotten time, a simple and industrious life. The pine clapboards with flaked white paint, 10 foot high windows facing south in the first floor rooms, large front porches, all spoke of family and light, reading and togetherness. One early summer morning I was walking down the path between the rows of barns and sheds towards the large Victorian house perched on a hill above Amwell Road. The grasses were already knee deep and the sun bright and warm. I had no worries, not a care. I had no plans, no ambitions, but walked towards the back of the house to the kitchen, now disused and devoid of appliances. I looked inside for a moment and then went around the side toward the front porch. My idle tranquility was suddenly broken by someone calling, speaking loudly to me. My impulse was to run; I was, after all, trespassing, although it took something substantial to register this thought. After running about thirty feet away I felt her saying to stop, it was alright. I did so, and turning I saw someone small standing in the shadows on the front porch. Nearing closer she was speaking to me, but I don’t remember what she said. I didn’t believe I was wasn’t in trouble, but being obedient to an adult, I obeyed. What I saw was an old woman about my size. She was thin and frail, white skinned and haired, wearing a simple dress that looked like more of a nightgown. On her feet she wore slippers. She spoke to me and I followed her into the house, and gaining confidence, I asked her what she was doing here. She said it was her house and her parents before her. The large front room had once been a family’s drawing room, probably with plush ornate furniture and bookcases along the back wall. There had been small end tables and large heavy curtains covering the huge windows. Now only the large oak boards of floor spoke of the past richness. The wallpaper was peeling and rotted, the windows broken out, the ornate plaster ceiling moldy but still bright. In one corner was a small bag with papers and an old thinned curtain from one of the upstairs bedrooms. It seemed to me that she had slept on the floor in the corner of the room. We spent the afternoon talking. She showed me around the property describing each of the buildings and for what purposes they had been used. We walked through the tall grasses so relaxed as if it was so perfectly natural for all of this to be happening. In the early evening I ran back to our house. It was a large Victorian also, but wide and flat. It was built on ground sloping away from the road with a stream behind it. There were three stories with the kitchen, dining room, bathroom, and furnace room being on the first floor and below the level of the road. In front, there was a flagstone courtyard that fronted the library and drawing room and their tall windows. The third floor above housed the bedrooms and above a huge attic with a cedar closet. The next day I went to the farmhouse - saying nothing at dinner the prior evening. I brought food and something to drink wrapped up in one of my mother’s dish towels. The lady seemed to be getting older, she didn’t do as much. I knew that she slept on the floor. I don’t remember her saying to me not to tell anyone. She told me about a great rain and flood that occurred when she was 10 or 11 years old. I couldn’t believe that she could remember something at that happened so long ago. 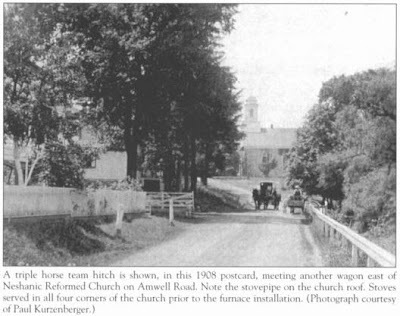 Amwell Road ran along a large creek, but just above the flood plain through which it meandered. The creek past her house joined the stream that ran behind our house down the hill and near our barn. Actually, our barn was just a carriage house, but big enough for two horses and a large carriage. Our house was originally a cottage built when the first church was being built in 1680. 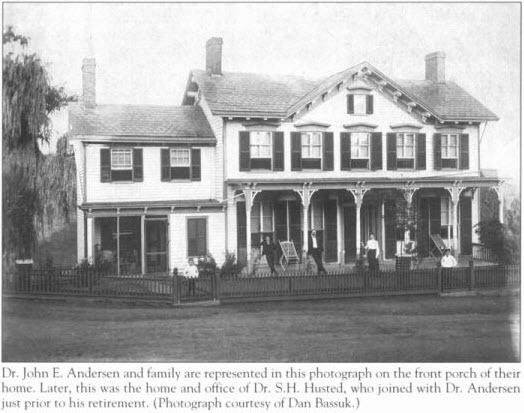 Afterwards, around 1720, the rest of the house was built by a doctor who relocated to the area. We bought it from Dr. Husted whose father had practiced in the house prior. It had been a doctors house for over a hundred years and they used our drawing room as their office. The flood was so huge that the water came all the way up to the front of her porch. She said our barn was under water but the houses, all built up higher, had water lapping close to them but were safe. Sitting on her front porch I could imagine the torrential rains and the enormous swelling of dirty brown water. The old woman was critical of the times today and of the new homes built along the road and even in the flood plains. Her ancestors had come to the area a very long time ago by wagon and I thought of the conestoga wagons from school books. She said that the first house had been built up the hill - she told me where I could find it. Her property, like all in Neshanic, sat at the foot of what was called Sourland Mountain. For most people, Sourland Mountain was not much more than a hill, but in New Jersey, it certainly seemed like a mountain. The land behind Neshanic was all undeveloped and unused. It was fields of tall grasses that became dry and yellow-blond in the fall. There were almost imaginary cherry tree lined fence rows of ancient rotted posts and stone walls that led forever; forgotten boundaries of fields and pastures. I do not remember what she said of her immediate family. She wasn’t an only child, but she was one of the last of her siblings. But this was her home. It was where she was born and where she had lived when she was young. She had moved away and started a family. But at this time in her life, she had wanted to come home and she had, but it was an act of defiance and that I knew. My knowledge was so naive. I knew nothing of life, of struggles, of insecurity, of hunger, or poverty, or joblessness. I accepted what I saw and treated kindness with kindness. And she was a kind, soft spoken, and intelligent woman. Time for a ten-year old is very different than that of an adult. Somehow a long day became me getting home just in time for supper. Supper was always formal, or at least the mood was. Papa and Mama, younger sister and brother. Round table, knives and forks in the proper hands. Napkin in the lap. Speak when spoken to. I needed to tell my story, but I waited. The air at first was always very heavy. One had to wait a bit for the food to calm the atmosphere and make it like a real family, like fun. One also had to be careful. My brother might be holding a secret and it was just a matter of when he was going to let loose and drop it and me. So don’t waste a good story if you’re going to be interrupted and the subject inevitably changed to what kind of trouble I was going to be in. This summer evening the meal was light and the elders were happy. When asked about my day I spoke up and told the story about an old lady who was living in the big farmhouse past the church. I told them about that she was born there and her great great great grandmother and father came there many years ago in a wagon and claimed the land. I told them about the great flood and how our barn was under water. I remember being so incredibly excited - I had entered this world of the past when the road was dirt and you used horses to get around. I remember being listened to but not believed. It was a strange feeling. There was quiet. I was being observed but not acknowledged. On the third day in the afternoon, I was going back to her house after my lunch. Walking between the rows of barns, workshops, and sheds, they had now been transformed into buildings with such positive presence that I knew the tools in one and the animals stabled in the other. They had become real and full of life, not decrepit and dull. Suddenly I noticed that there was a station wagon in front of the house. I ran to hide and saw several people coming down off of the porch with the old lady. They were kind and careful, but huge and dominant. She got in the car and a few moments later they all climbed in and drove off. I sat for a while and then slowly left, afraid to go any closer. She was gone. I never saw her again and I never got to say goodbye. I didn’t know that what I would feel years later was such a loss. She had become my friend. But I was ten and I didn’t understand. I didn’t understand that I could feel so much for someone I didn’t even know. This third evening I told my story at the dinner table and for the third time I was told to stop telling stories, to stop telling lies. At the time, that was most significant, that my parents didn’t believe me when I was telling the truth. It went on for a week and I got to the point that I wasn’t sure myself if it had really happened. I snuck out from my punishment to the house and climbed onto the porch. Pushing open the door, whose antique locks had been borrowed years before, I stood and looked around. In the corner, there were some papers and the tattered curtain she had covered herself with while she slept. I knew and I didn’t need to tell. The perception of others was not my reality, but they could make it hurt. Sometime later I learned that the wonderful old lady had left a nursing home and had somehow gotten to the house where she grew up. She died shortly after. I was happy to have known her. And with my brother, I went through the fields and up the mountain behind her barns and we found the old stone foundation of which she spoke. We even found a spot in the shape of a large wagon with only rusted metal rings and straps remaining - we imagined it was the original. The black and white photos I happened to find online in a history book on Neshanic. The first two are of our old house, the third a view from near her house looking along Amwell Road towards the church. 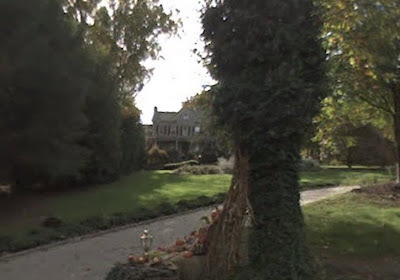 The color photo was taken from googlemaps and is a view of her house today.